They will take office May 1, 2019 and term runs through April 31, 2021. Thank you to all the outgoing officers and congratulations to the new officers. The Nominations/Election Committee announces that there are eight officer positions that are up for election this year. The officer positions are President, seven Vice Presidents as well as Unit Representatives. 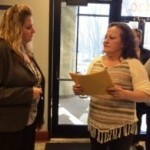 Nurses from two Hackensack Meridian Health hospitals ratified a 22-month contract that includes a pledge to hire more nurses, satisfying what their union said was their biggest concern. 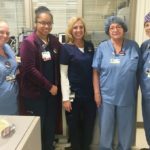 On Thursday, December 13, 2018, Registered Nurses with the Health Professionals and Allied Employees (HPAE), at Jersey Shore University Medical Center (JSUMC) and Southern Ocean Medical Center (SOMC), ratified new 22-month contracts with Hackensack-Meridian Health. 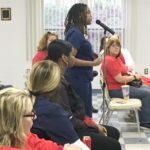 Nurses from Jersey Shore University Medical Center and Southern Ocean Medical Center have reached a tentative deal on a new contract, union officials said Thursday night. 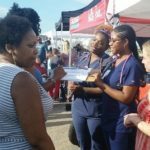 Nearly 2,500 nurses and health professionals across the health system bargained with HMH administration since late spring. 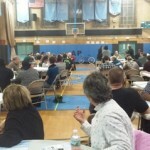 local 5058 members: tentative agreement reached! 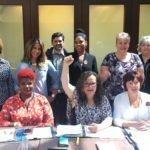 Our local bargaining committee is pleased to announce we have reached a tentative agreement for a new contract with HMH, which must be ratified by the membership. 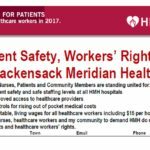 Negotiations between Hackensack Meridian Health and HPAE have been tenuous as 2,500 represented are fighting to put an end to intimidation tactics in their workplace and to demand safe patient limits in the interest of patient and worker safety. 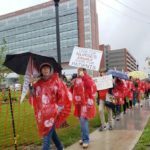 The Health Professionals and Allied Employees accused Hackensack Meridian Health today of illegally orchestrating a union decertification effort using aggressive anti-union tactics that will ultimately fail. On Sunday, union nurses picketed again in Neptune, showing strength and resolve in our fight for a contract we’ll be proud to ratify. 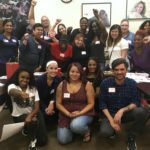 We’re fighting as a union for safe staffing levels for our community and quality benefits like insurance and time off for our families. 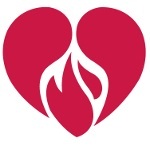 Health professionals speak out to protect their patients, and as a union we go beyond the walls of our facility to help our communities understand the risks and incidents that occur when we are caring for too many patients. The nomination and elections for HPAE Convention delegates has concluded. 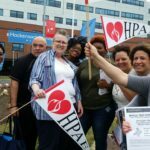 Health professionals represented by HPAE have given notice to Hackensack Meridian Health (HMH) of their intent to conduct informational picketing on August 15. Taking our fight to the community! As HMH continues to stall at the bargaining table in an attempt to wear down our negotiating committees with unreasonable and unsafe proposals, we, the members, are taking our message to the public. 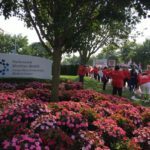 As of 7:00 AM on July 31, the contracts expired for two more HPAE locals currently in bargaining with Hackensack Meridian Health (HMH). After weeks of delays, management goes to bed while our contract expires. 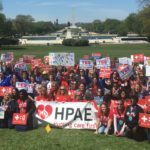 HPAE requested a Federal Mediator to assist in scheduling bargaining dates before the end of July and attend the ongoing negotiations. 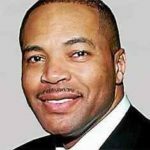 The contract, covering nearly 1,100 workers at both facilities, now owned by Hackensack Meridian Health, expired on July 20. 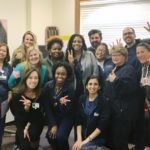 HPAE nurses and health professionals at four Hackensack Meridian locations have voted in favor of engaging in concerted activities. 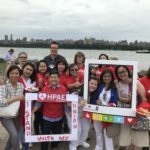 Nurses from our hospitals were joined in bargaining by HPAE members from Palisades in Hudson County. The Nominations/Election Committee announces that they are now accepting nominations to represent Local 5058 at this year’s HPAE State Convention. Bargaining is underway as we stand together for our patients! We return to the bargaining table tomorrow. Everyone deserves a day off! Hackensack Meridian continues to unreasonably deny members the time off we earn and has not provided information necessary for pursuing our grievance. Members from Local 5030 told stories to the health system’s bargaining team about staffing problems at Palisades that could put healthcare workers and our patients at risk every day. 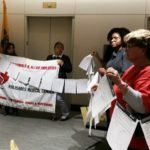 The Nurses and Health Professionals at Hackensack Meridian Health are demanding that large corporation put patient care before corporate wealth. 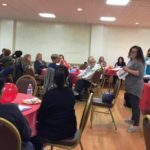 HPAE and the Coalition for Patient Rights and Safe Staffing celebrated Nurses’ Week at a Town Hall event on “Patient Safety and Safe Staffing in Healthcare.” Safe staffing levels continue to be the most important issue for healthcare professionals. 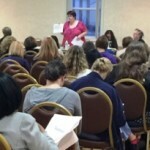 Local 5058's New Nurse Caucus held two well-attended “Know Your Rights” workshops this Monday. The caucus members learned about the practical applications of using our legal rights under the National Labor Relations Act (NLRA), as well as our "Weingarten Rights,"
Members leaders of Local 5058 kicked off the “New Nurse Caucus” at a meeting on Tuesday, September 12th and unanimously adopted a mission statement. 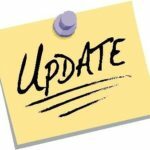 We've prepared a special update for members regarding the recent contract settlement with HMH, as well as class action grievances concerning health insurance, prescription drugs, and the market rate adjustments. 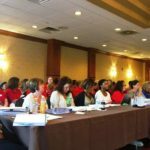 Nurses at Hackensack Meridian Health (HMH) hospitals represented by HPAE voted on Wednesday to approve a one-year contract. 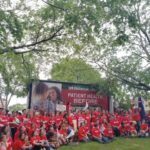 After nearly two months of negotiations that extended beyond the contract deadline of July 31, a tentative agreement has been reached between nurses represented by HPAE and Hackensack Meridian System. 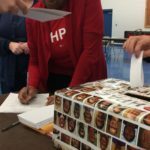 Local 5058 members were forced to take a strike vote on Thursday, 7/20 after HMH refuses to agree to the union’s reasonable proposals that put patients first. In negotiations on Monday, July 17th, our local bargaining committees were joined by 50+ nurses from JSUMC and SOMC to discuss issues members have experienced using the employer's health insurance plan. 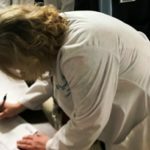 Nearly 1,500 nurses represented by HPAE at Jersey Shore University Medical Center in Neptune and Southern Ocean Medical Center in Manahawkin are negotiating for a contract that protects patients, healthcare workers and their communities at each HMH facility. 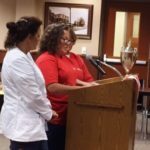 On Monday July 10th, 60+ HPAE members joined the Local 5058 and 5138 bargaining committees to demand safe staffing. As contract negotiations get underway, HPAE Local 5058 RNs at Jersey University Medical Center/Hackensack Meridian Health were out in the community yesterday to talk to community residents. 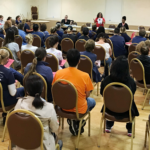 Nearly 1,500 nurses represented by HPAE, NJ’s largest healthcare union, at Jersey Shore University Medical Center in Neptune and Southern Ocean Medical Center in Manahawkin, began negotiations with Hackensack Meridian Health (HMH) on Wednesday, June 21. 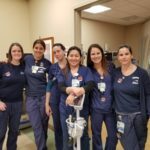 HPAE locals are standing united with the community for patient safety and safe staffing levels at all Hackensack Meridan Health (HMH) hospitals. 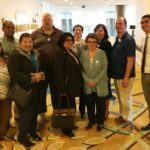 The presidents and members of Locals 5030, 5058, and 5138 went to Hackensack Meridian Health (HMH) corporate headquarters demanding to talk to corporate executives about the need for a fair contract. 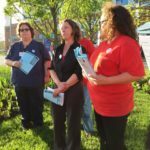 HPAE Local 5058 members joined with community members served by Hackensack Meridian, members of CWA Local 1037, and NJCU to hold a Speak Out last night near the hospital to build solidarity in the fight against corporate healthcare. 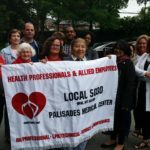 HPAE Local 5030/Palisades Medical Center began contract negotiations with Hackensack Meridian Health today. 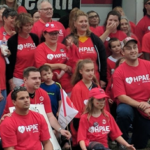 Meanwhile HPAE members at Local 5058/Jersey Shore Medical Center and Local 5138/Southern Ocean Medical Center are standing with Palisades members, United as HPAE @ Hackensack Meridian. Local 5058 held its annual Membership Retreat yesterday. In addition to updating Reps and members on the upcoming negotiations, we had CE workshops which provided a total of 5.0 contact hours to the attendees. Local 5058 members and officers distributed flyers today in front of the hospital to put the spotlight on an issue affecting our members and the community: medical debt. 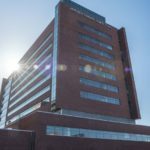 HPAE locals at Palisades Medical Center, Jersey Shore University Medical Center, Southern Ocean Medical Center, and The Harborage - all owned by Hackensack Meridian Health - have initiated a petition campaign to highlight priority issues. 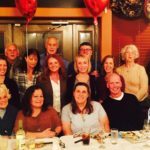 Rita Hrscko, a former President of Local 5058/Jersey Shore University Medical Center and a long-time HPAE union activist, is retiring after a nursing career that has spanned 40 years. 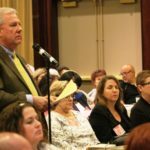 At the HPAE 2016 Convention, delegates came together to make important decisions about the future of our union through a series of resolutions, constitutional amendments, and by-laws changes. 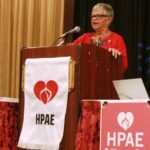 Over 200 HPAE leaders, members, staff, and guests came together at the HPAE convention to discuss the challenges that we face from the corporatization of health care and how we, as a union, can best respond. 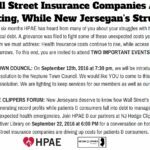 Members of HPAE Local 5058 spoke before the Neptune Township Committee yesterday about the negative impact of medical debt on our members and the community. 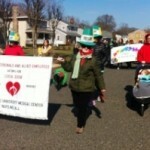 Continuing an annual tradition, Localo 5058 joined with thousands of other people to take part in the 43rd annual St. Patrick’s Day celebration in Belmar, NJ. 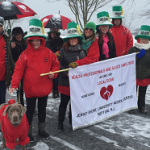 Local 5058 members had some canine companionship as they walked the parade route.